Anyway, some cool news: Optipess will be a part of LAUNCH PARTY, a webcomics anthology consisting of 25 artists, and the other 24 are HUGE. We’re talking Shen Comix, Lunarbaboon, Deathbulge, Mr. Lovenstein, Extra Fabulous, Buni, False Knees, Berkeley Mews and more! I’m absolutely honored to be a part of it. Snag your copy on Kickstarter here! 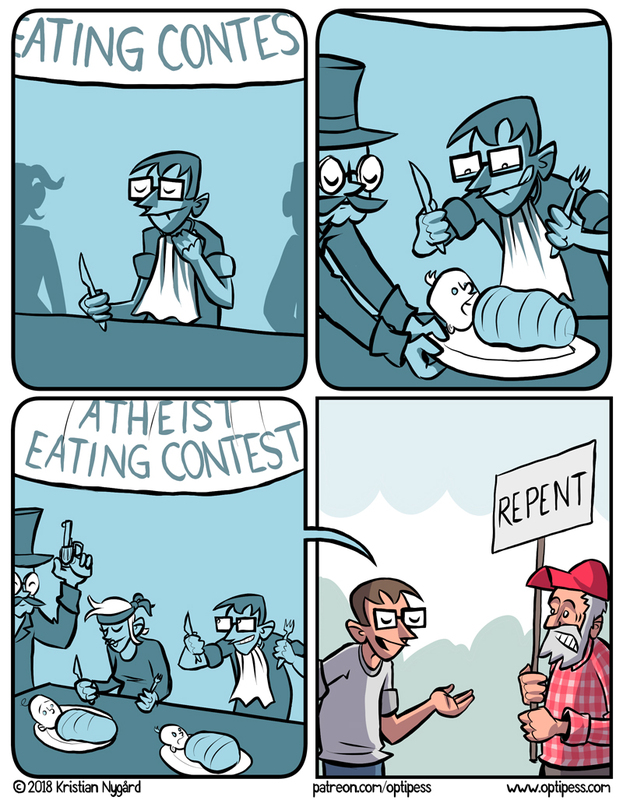 So they are eating atheists? Can babies be considered atheists? Since apples are not baptized and lack intelligence they are unable to believe in any god and thus should be classified as atheists as well. Does this means that the base of human diet is an atheist diet?